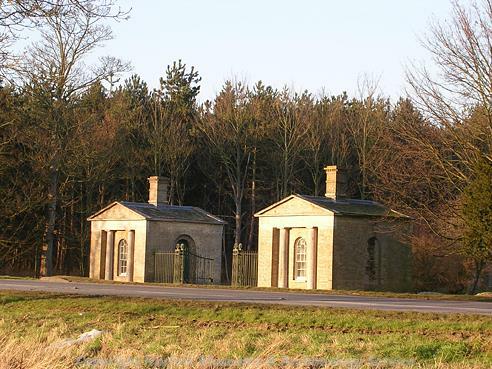 These two gate lodges were built between 1785 to 1790 by Sir John Soane. They are of gault brick with Portland and York stone dressings and a slate roof. Wrought iron railings are attached on a brick plinth, with square-cage gate piers. The southeast lodge has an original fireplace, and the northwest lodge has 19th century grate. Two gate lodges, built around 1785-90 by Sir John Soane. Gault brick, Portland and York stone dressings. Slate roof, pedimented gables. Each one storey, square plan. Gable walls north and south have pair of recessed Tuscan columns supporting metope frieze and gable pediment. Central round-headed sash window between columns. Cornice overhang with guttae continues along east and west walls. In east wall facing driveway, round-headed door with arch of two orders. Blind round-headed recess in west wall. Central stack on ridge; fireplace on west wall. Wrought iron railings attached on brick plinth, and square-cage gate piers (reverse east and west directions for southeast lodge). Southeast lodge has original fireplace, northwest has 19th century grate. Under restoration 1986. Compiled by E. Rose (NAU), 23 July 1986. See newspaper articles (S2) and (S3) in file. --- Photograph: Photographs of Thurton Lodges to Langley Park. Colour & Black and white. --- Photograph: Photographs of Thurton Lodges to Langley Park. Black & white. --- Archive: Clarke, R. R. and NCM Staff. 1933-1973. Norwich Castle Museum Record Card - Post-Medieval. Thurton. <S2> Newspaper Article: 2 March 1978. Eastern Daily Press. <S3> Newspaper Article: 1987. Eastern Daily Press. 27 June. 2.